Call Ideal Restaurant Supply Now! Make an Appointment for Demonstration ! The Fire Deck 6045 features a standard door opening 34 inches wide x 10 inches high. The cooking surface is 40 inches wide, and 34 inches deep, resulting in 9 square feet of usable deck space. 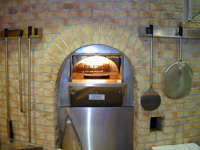 The dense, high temperature ceramic formulation of which the hearth and dome are cast creates a "deep heat sink" within the chamber of the oven. The chef is protected from the heat of the chamber by the ceramic glass door/heat shield. The heat shield glides smoothly and easily using a simple counterweight, and can be safely left in any position. Whether it is open or closed, the operator and the customers can see into the brightly illuminated chamber. 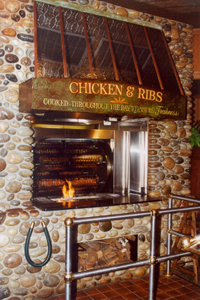 The Fire Deck is unique among deck ovens in that the oven operates efficiently with the door open or closed. 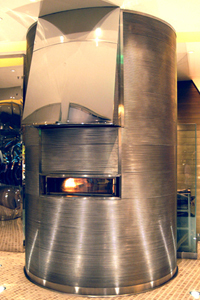 The Fire Deck 6045 is available in a variety of burner and fuel configurations. The standard unit has a manually adjustable wall of radiant flame on one side of the oven chamber (specify right or left at time of order), as well as a thermostatically controlled gas infrared burner beneath the oven deck. Either or both of these burners can be omitted to accommodate the use of wood as a fuel source. The 750-pound, monolithic, cast-ceramic floor sits on 4 inches of rigid insulation and is poured to a thickness of 4 inches. The 950-pound, monolithic dome is also cast to a thickness of 4 inches. The hearth and dome are connected by a carefully tensioned steel exoskeleton, which ensures structural integrity and long life. 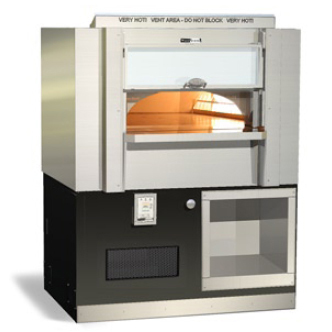 The oven's ceramic dome is wrapped with at least 2 inches of spun ceramic fiber insulation and enclosed (top and sides) with 16-gauge galvanized steel. The body of the oven rests on a 10-gauge steel pan welded to a heavy-duty stand, coated with a durable black finish. The upper face of the oven body is finished in stainless steel. A stainless steel storage compartment is optional and can be provided in the support frame. The oven arrives completely assembled and may be accompanied by a set of temporary rigging casters (optional) to aid in moving the oven into place. 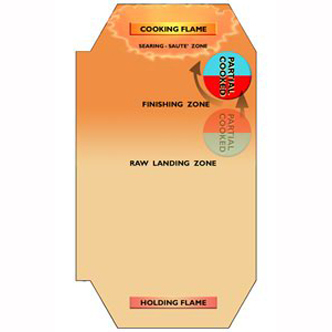 The Fire Deck must be vented using a Type 1 exhaust hood, or one constructed in accordance with NFPA 96 and all relevant local and national codes. Ovens with a -W in the model number must be vented as a solid fuel appliance. The oven must be vented in accordance with all relevant local and national codes and in a manner acceptable to the authority having jurisdiction. 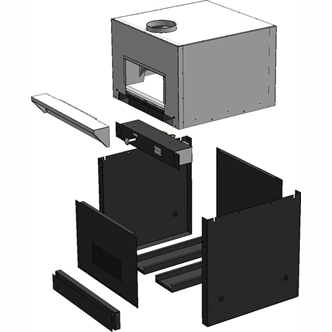 The oven is approved to be installed with a minimum 1-inch side clearance to combustible construction. Unit Shipping Weight: 3,200 lbs. We Care What You Think About Us!